The target calculations ChemApp is able to perform are a very powerful tool to find one’s way around a phase diagram. The following program demonstrates, for the binary system Pb-Sn, how target calculations and standard equilibrium calculations can be used in the calculation of phase constitution. Figure 1 shows the binary phase diagram Pb-Sn, as it has been calculated using the two-dimensional phase mapping module of FactSage. The items labeled will be calculated in the course of this application example. Retrieving the necessary mole fractions and amounts which are associated with the ‘lever rule’ for an alloy at a given composition and temperature (item 2 in Figure 1). The determination of the temperature at which a phase (e.g. a solid phase from the liquid) starts to precipitate (precipitation target calculations, item 3 in Figure 1). Calculations similar to the ones above, but with composition instead of temperature as the target variable (item 4 in Figure 1). C metastable miscibility gap in the system. C calculating extensive property (e.g. 'heat') balances. C does not need to be very accurate. C the alloy, which is 0.5. C with EPS being zero within the numerical precision. C As you can see, the lever rule is sufficiently satisfied. C under which a second phase becomes stable. C not need to be specified) has unit activity. C 500 K where LIQUID is formed (or precipitates). C thus supposed to vary. C Pb/FCC/ symmetrically between 1 and 0. C 'IA', upon which the equilibrium is calculated. 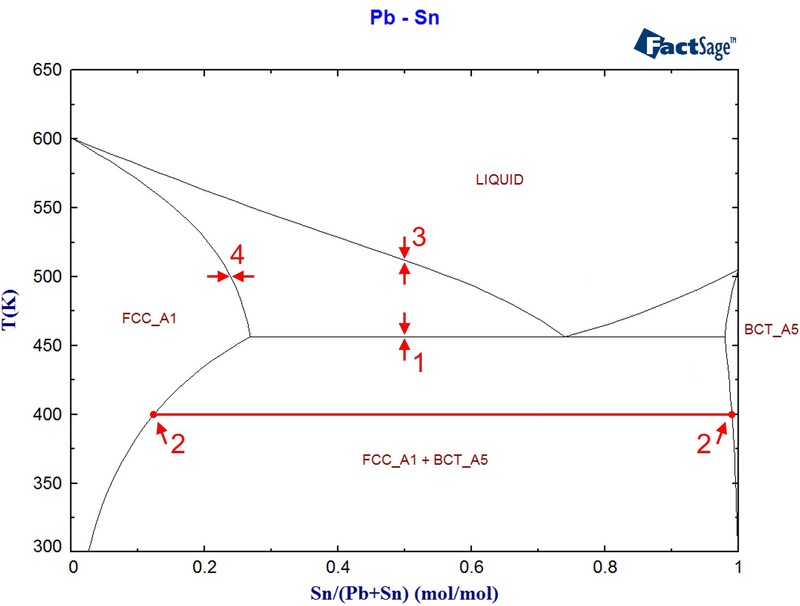 C mole fraction of Sn in the FCC phase) is retrieved. Continue with the code example “One-Dimensional Phase Mapping” or jump to the code example “Process Modelling Using Streams“.